New mask work in progress, Deviant Art, and digital painting. A recent conversation with a dear friend sparked some dark and interesting mask ideas, so following on from the oriental masks I did last month, I’ve remained with papier-mache and am happily experimenting. I’ve done pretty and colourful masks for a while, so it’s high time I indulged my darker side. I’m currently working on a mask which will have a fine tracery of cracks across its surface, like an antique porcelain doll. It looks creepy already, and I’m quite excited at the effect. I have also been spending quite a lot of time at Deviant Art. The community is excellent for networking amongst like-minded artists and bouncing ideas around, and I’ve made a few really good friends there. Check out Reincarnations for beautiful hand-painted furniture, and some of the most fascinating candle-holders I’ve seen for a long time. 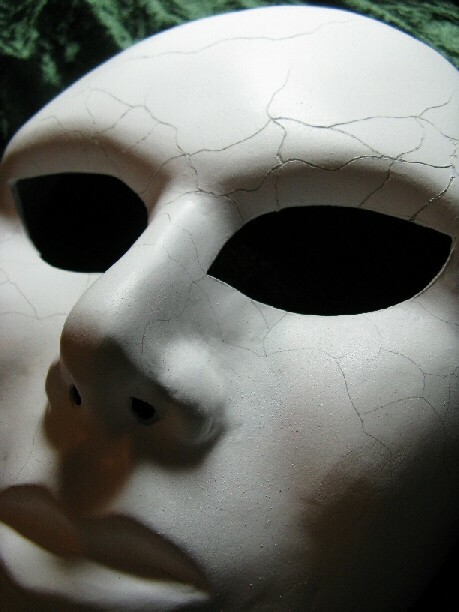 Hi im working on a script for a movie and in this movie im going to have porcelain masks i really like this plain white mask picture you have displayed here and i was wondering if you would mind me using it for cover art.